You may remember that I previously posted some Apricot pieces I’d tried on a visit to M&Co a while back. 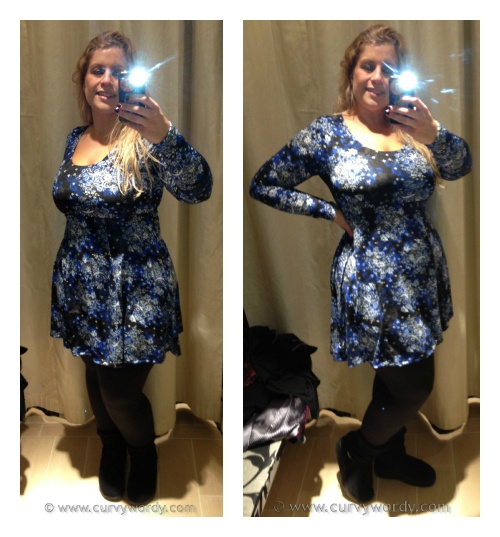 I’ve long been a fan of the Apricot brand and back in December 2012 I visited their Bluewater store to try some pieces on. After being warmly welcomed by the store staff I had a good look round at the latest ranges. I appreciate that this post is a few weeks overdue so many of the items I tried are now in the sale. I still thought it would be worth showing them to you, however, and I’ll also pick out a few of my favourites from the current collection. This jumper dress was great – it hugged in all the right places and was really cosy. I love the v-neck cut and the three-quarter length sleeves, which would stop me getting too hot. The length was good too as it came down to just above the knee. This was a size 14 – the largest I could find instore – but I think if a 16 had been available I’d have liked to give it a try. The Fuchsia Contrast Panel Jumper Dress is still available online and is currently on sale – reduced from £29 down to just £15. And it’a also available in grey here. Again, this was a size 14 and it fitted very snugly so if there had been the option to size up I think I would have done, although I suspect it would’ve then been too roomy on the waist. But it was lovely nonetheless! I’ve actually seen several tv presenters wearing this recently so it’s certainly been doing the rounds! The contrasting stone areas are cunningly shaped to give a flattering effect and accentuate the bust and hips, whilst minimising the waist. The fabric is lovely too – super soft and very stretchy. This Stone Illusion Jumper Dress is also in the sale at the moment, reduced from £30 down to £20. This dress is no longer available on the Apricot website – I daresay it sold out as it’s very pretty – but it may still be on sale in stores. 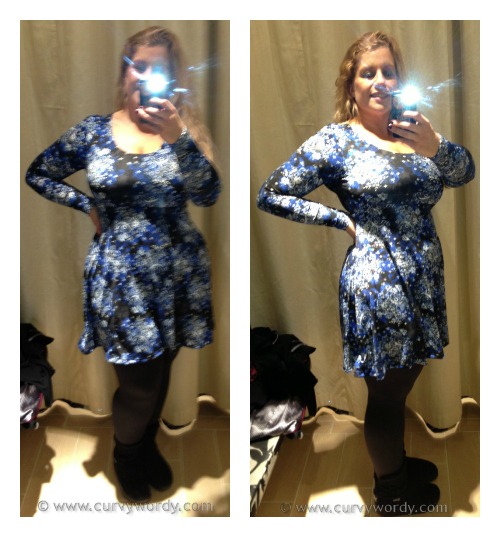 This was again a 14 and it fitted well everywhere except the waist – it was much too big! However sizing down to a 12 would have been no good as the 14 was snug on the bust. I didn’t buy this as I’m not a skater dress person – I prefer my skirts a little longer! I had a great time trying these items on and if I’d had more time I definitely would have tried on other pieces, too. Apricot recently launched their Spring Summer 2013 collection and I’ve already got my eye on a few items. The Bubble Print Crossover Dress (£27) is lovely! I adore blue, in particular royal and aqua shades, and the cut of this dress is so perfect for summer. The dress is 100% polyester so really easy to wear and ideal for taking on holiday for a cover up on the beach or adding a belt, accessories and killer heels for a night out. The Black Paint Splash Tulip Dress and Coral Paint Splash Tulip Dress (£28 each) are right up my street. With the crossover bust and defined waistband, this shape of dress is bound to look show-stopping on any hourglass figure. The dresses are 90% cotton and 10% elastane so cool for summer but with the added benefit of stretch for the perfect fit. I am itching to try these two for myself! I must admit that I don’t own any dip hem dresses but this gorgeous number has really stolen my heart! The Floral Belted Dip Hem Dress (£31) is 100% viscose and the print is simply stunning. I seriously want to give this one a try. The Red Passionflower Tulip Dress is a similar shape to the two I’ve listed above but the black and red are really eye-catching. Again, the mix of 95% polyester and 5% elastane gives a great shape that will skim curves and nip in at the waist. And the best thing about it? It’s currently in the sale for just £10! Wow! And it’s also available in white and black here. There are so many lovely items on the website (with a huge amount on sale right now) that I could have listed heaps more, but I have to stop somewhere otherwise this post will go on forever! Apricot is a brand that has something for everyone, be it young, trendy types, or slightly older ladies who are looking for something a bit different but to still dress their age. My only gripe is that the sizing only goes from 8 up to 14, with only a select few items in 16 and even fewer in 18. Please, Apricot, extend your sizing to encompass more plus sizes as I know a LOT of ladies out there who’d love to wear your clothes but can’t due to the sizing limitations. We all want to be able to experience the happiness of Apricot clothing! If you like contrast panel dresses what about this cute number here: http://www.urkye.pl/en_US/p/Skunks-amarantowy/193 ? I think that would be much better fit. Hi there, thanks for your comment. 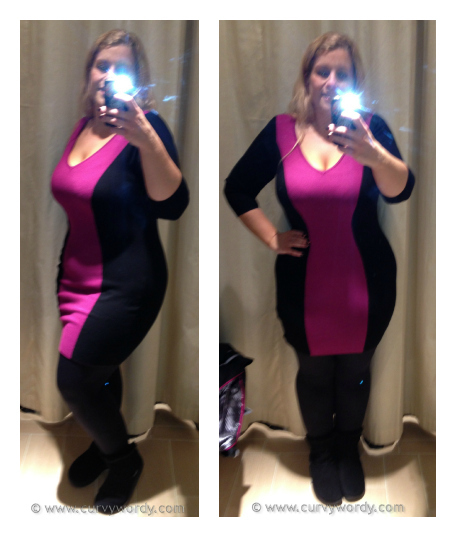 The pink/black dress in this post is a jumper dress so it will naturally fit differently to regular dress fabric and not be quite such a snug fit. The Urkye one you've linked to is lovely and I'd be delighted to try it if only it was available in smaller waist sizes. Hi! Just checking – you're saying you haven't tried the Skunks dress because it doesn't come in small enough waist sizes? If so, I just wanted to make sure you know they aren't using UK sizing – their smallest waist size (34) fits about a 64cm/25in waist. 🙂 I'd love to see a review of this dress from you!